East Villagers willingly wait in line at this chic Asian-fusion eatery. : When David Chang closed up shop at his first restaurant, the tiny Momofuku, and moved it up First Avenue, the potential for an overreach or a misstep was high. Bigger in size, more ambitious in scope and saddled with mountains of hype to match, the move was fraught with peril. Luckily for fans of Momofuku, Chang has another hit on his hands. The interior is much the same as the old space, only twice as big, and now includes two bars and communal tables in order to really pack them in. Blonde wood and sharp angles still predominate, though. Ironically, what’s been cast aside in the process was the one thing that made the original Momofuku so popular at the outset: the ramen. 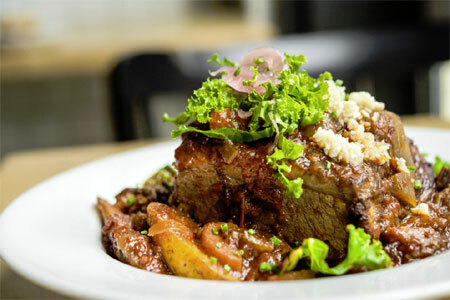 In the context of the evolved menu, which features some items outsourced from the Momofuku Ssäm Bar, including the grilled sweetbreads and pork buns, the ramen seems a little bit less exciting, though packed with multiple cuts of pork, it’s no less appealing than it was before the move. There are also cheeky additions, from kimchi stew with braised kimchi, rice cakes and shredded pork to smoked duck breast accompanied by cinnamon sour cream and pickled mustard seed. To top it all off, there’s even soft-serve ice cream cones for dessert, available as a swirl and with carrot cake crumbs in the bottom of the cone. 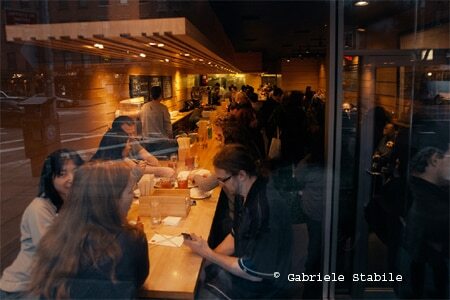 Like the rest of the Momofuku Noodle Bar, it shouldn’t work, but it does --- and even manages to exceed expectations. Note that the restaurant does not take reservations except for the fried chicken meal.